I have two of my most favorite (ever!) cards up on The Ribbon Resource Blog. 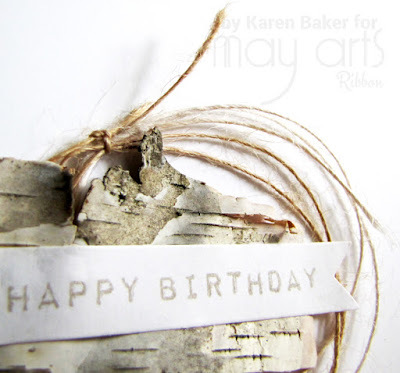 They feature looped May Arts Burlap String (which is on sale at The Ribbon Resource) as well as some birch bark I found in my back yard! I'd really like it if you go and check out the full post if you are interested! 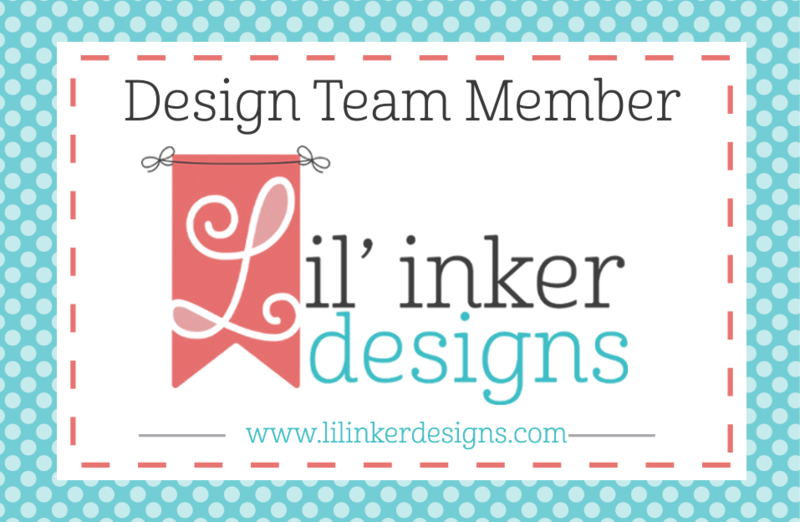 Lil' Inkers Designs has a monthly challenge-did you know? The Monthly Meetup Challenge! 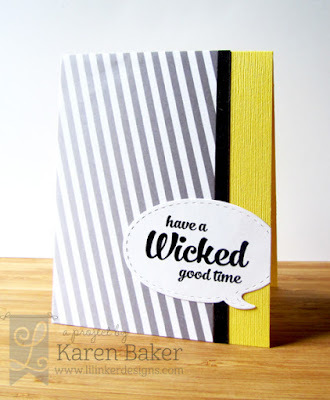 Create a card or project using Lil' Inker Design products and the colors of fall and link up over at the Lil' Inker Designs Blog. This month there is a corresponding sale too! 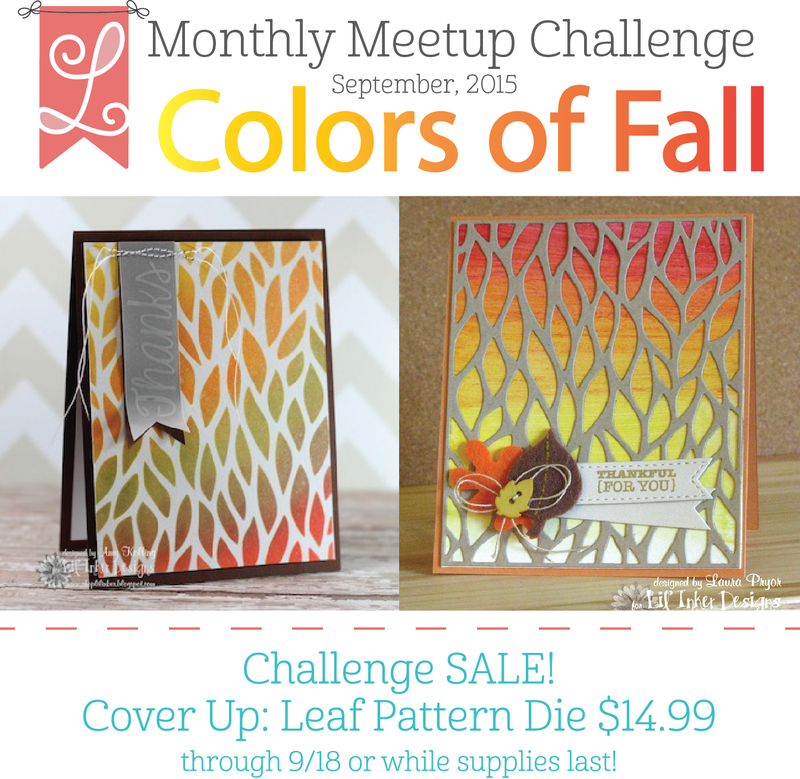 My card features the sale item, the Cover Up: Leaf Pattern Die. Instead of die cutting the leaves, I embossed a piece of decorative paper, sanded the raised areas and then distressed inked over the top. 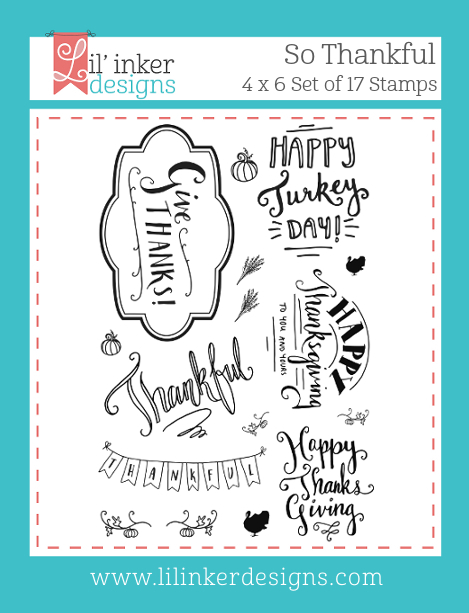 I adhered this panel to a card base, then added a sentiment from Greetings and Salutations Stamps that had been stamped onto a die cut label from the So Thankful Label Die and then I added the extra detail of the stamped label image from the So Thankful Stamp Set. I finished the card by going old school and added two brads. 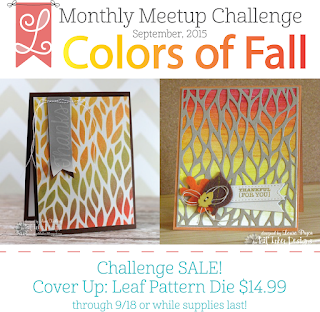 Stop on over at the Lil' Inker Designs Blog for more details on the Monthly Meetup Challenge! Welcome back to the third and final day of the Lil' Inker Designs September Release! 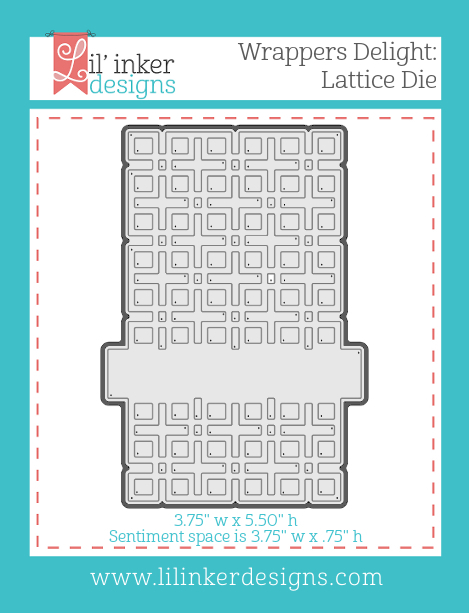 As usual, we have a fabulous hop for you featuring innovative stamps and dies, I hope you enjoyed this amazing release! You should have arrived from Lisa Henke's Blog! I really wanted to showcase a rustic, fall theme with this first card. I started with a sand card base with inked edges and embossed a woodgrain pattern from Lil' Inker Designs Cover-Up Die: Stitched Woodgrain. 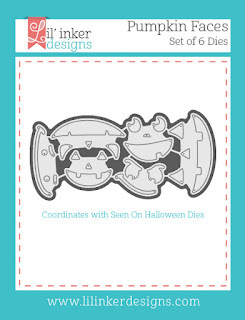 I then die cut a simple, elegant pumpkin and stem from the new Seen On Halloween Dies and inked the edges. I added the extra detail of the stitched ribs from this set as well, what a cool feature! Before adhering the pumpkin to the card base, I used an elegant, perfectly sized sentiment from Seen On Halloween Stamps. Finally, I adhered the pumpkin to the card base and finished with a bow from made from May Arts Natural Burlap String. My last project of this release switches styles with a bright, fun and clean Halloween Card using the fun Here for the Boos Stamp Set, Seen On Halloween Dies and Pumpkin Faces Dies. 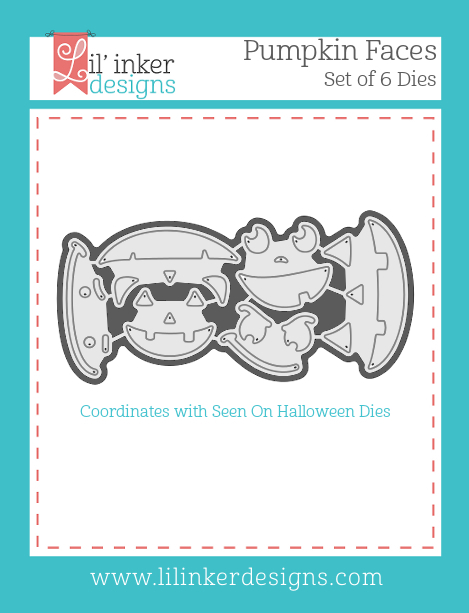 I decided to make the most use out of the negative die left behind when die cutting the pumpkin from the first card, using the Seen On Halloween Dies. I simply cleaned it up by running the piece through my die cutting machine again, framing it with Lil' Inker Designs Stitched Mats: Squares. 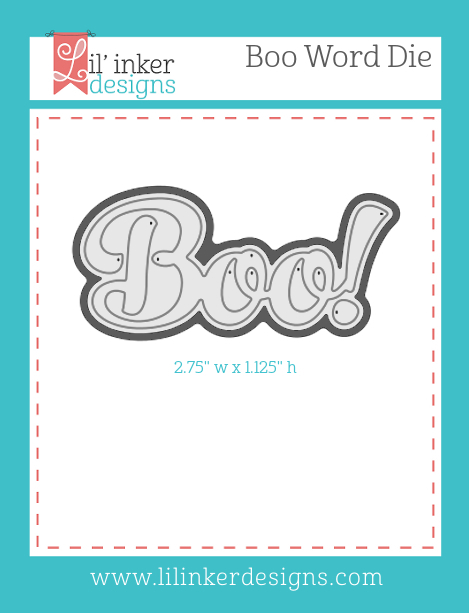 I then created a card base using the Lil' Inker Designs Stitched Mats: Squares again and stamped a bold sentiment from Here for the Boos Stamp Set. 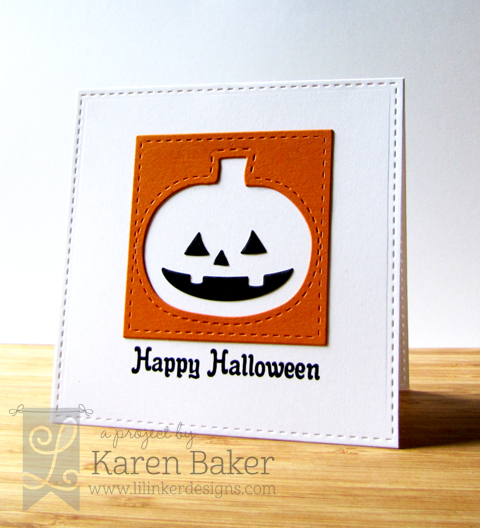 I adhered the pumpkin frame to the card base and finished with a cute jack-o-lantern face die cut from the Pumpkin Faces Die Set. Your next stop today is Amy Kolling!! LID:: September 2015 Release:: Day 2 Post! Hands down, my favorite season is fall and I love that the weather is starting to reflect cooler temperatures and signs of fall. 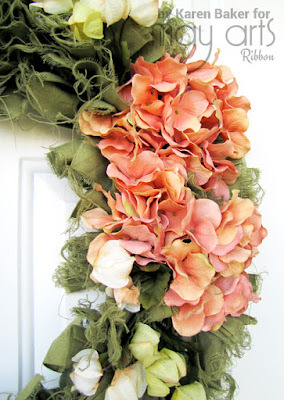 I have a rag ribbon wreath featured on The Ribbon Resource Blog that is perfect for the transition of seasons. Please stop on by to see the full wreath! 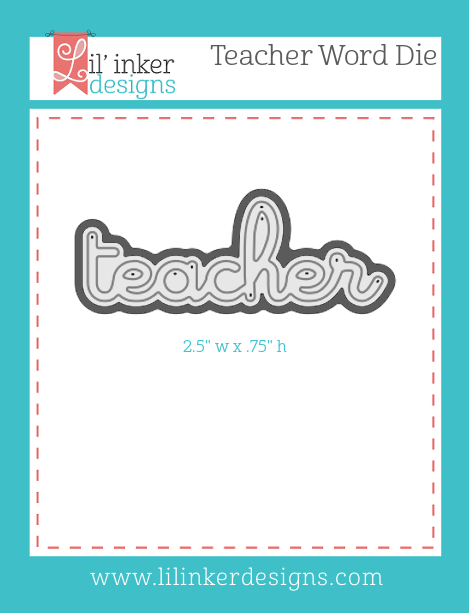 Welcome back to the second day of the Lil' Inker Designs September Release! 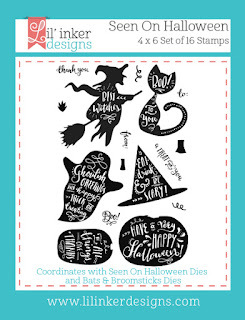 As usual, we have a fabulous hop for you featuring innovative stamps and dies! You should have arrived from Laura William's Blog! My first card features the wickedly awesome and super fun stamp set Boo & Faces 2, along with previously released products. I started with a yellow card base and added a panel from Lil' Inker Designs Ombre' Stripes Paper Pad, as well as a black strip of cardstock. 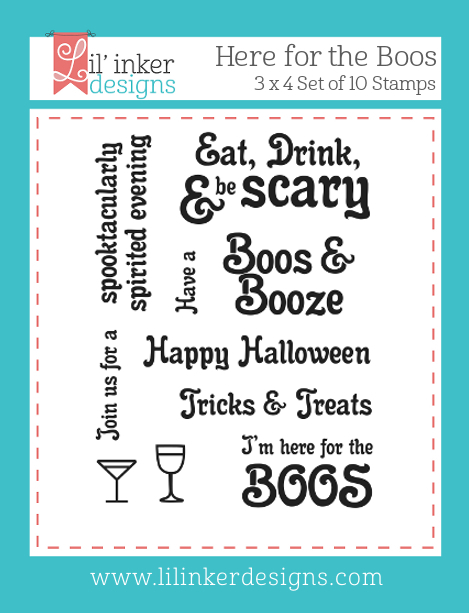 I then created and stamped a sentiment from a few stamps from Boo & Faces 2 and die cut a speech bubble from Speech Bubbles 2 Die Set and adhered it to the card. 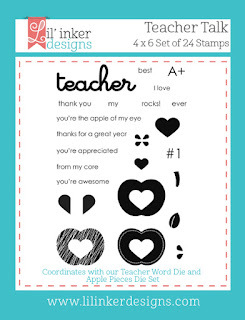 I think it is great this stamp set could be used year round, this card is going to my co-worker who is heading out for a two-week vacation! 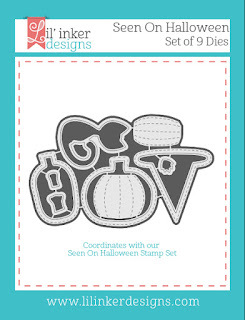 My second card features the the super cute Pumpkin Faces Die Set and Boo! Word Die. Aren't they super cute?! For this card, I die cut the Boo! 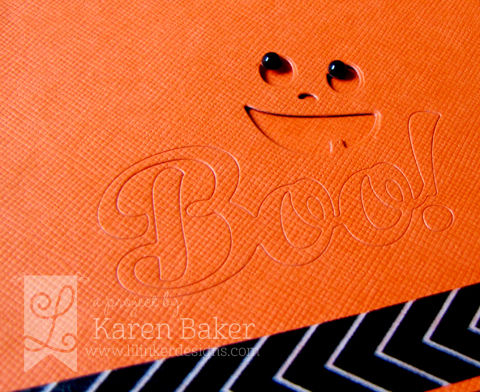 Word Die from an orange cardstock card front. Without removing the die cut words, I adhered a few strips of washi tape on the back of the card to secure it in place. I then ran the card front through my die cutting machine again, this time using a super cute jack-o-lantern face die from the Pumpkin Faces Die Set. These pieces I did remove, for a see-through effect. 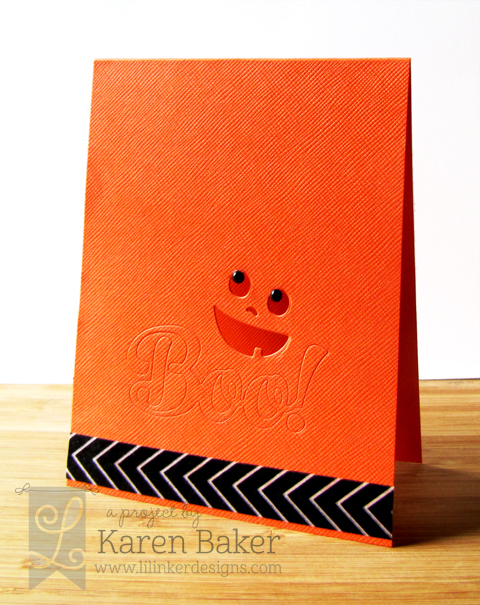 I finished the card with a strip of coordinating washi tape and two black enamel dots to highlight the cute jack-o-lantern eyes. 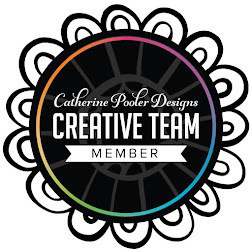 It's the first day of the Lil' Inker Designs September Release and the new products make me so thankful that I am a part of this crafty community! I love them, and I am sure that you will too. 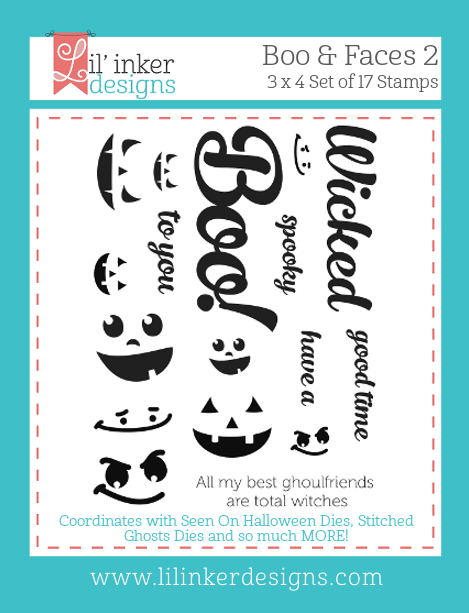 As usual, we have a fabulous hop for you featuring innovative stamps and dies! You should have arrived from Lil' Inker's Design Blog! I have two projects to show you today! 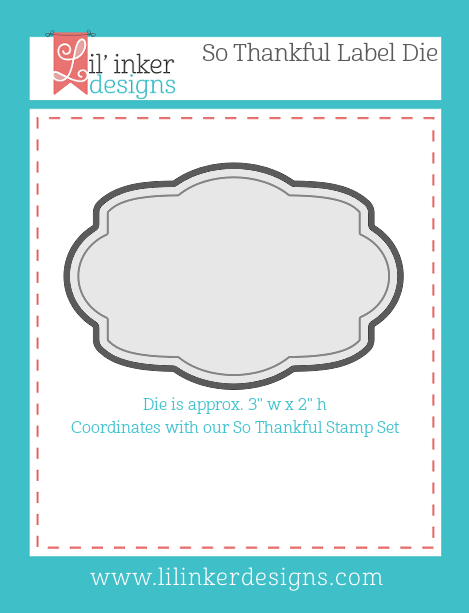 My first card features the new So Thankful Stamp Set and coordinating So Thankful Label Die as well as the Wrappers Delight: Lattice Die (that I designed!). I really wanted to bring out the fall, rustic theme on this card, so I chose neutral colors and even added some feathers and burlap. 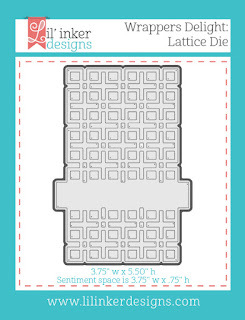 I first die cut the Wrappers Delight: Lattice Die onto cream cardstock and then adhered it to the sand colored card base. 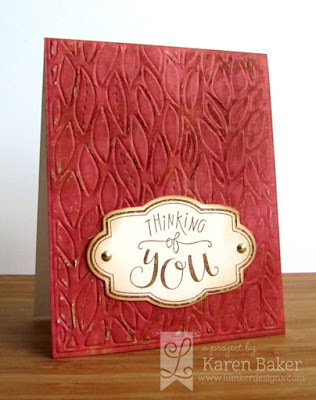 (I just love this series of dies, they cover almost the whole card front-so intricate, yet quick and easy! and takes the guess work out of where to place a sentiment.) For the sentiment, I stamped a beautiful greeting from the So Thankful Stamp Set and die cut it out using the So Thankful Label Die (which is so versatile as the sentiments are not connected to the border stamp so any greeting can be used!). I adhered the label to the card base with foam adhesive, after adding a feather array and looped Natural Burlap String from May Arts. 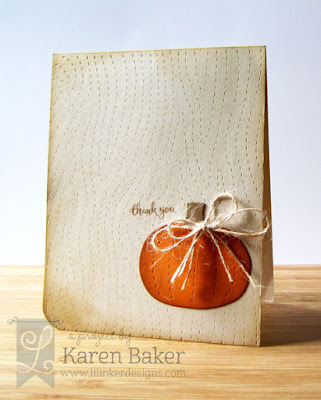 I adore the texture and the subtle hues on the card, perfect for fall. 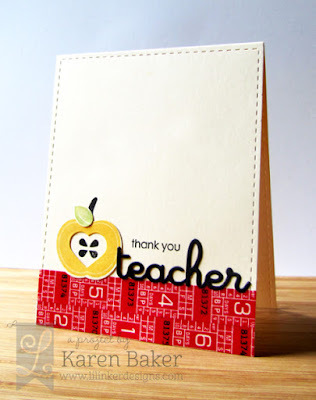 My next card features a thankful theme as well, but this time it is for one of the boys' amazing teachers! The Teacher Talk Stamp Set and coordinating Teacher Die and Apple Pieces Die Set are perfect for this time of year to thank the individuals that nurture your child's mind. I'm excited to be able to use these products in the spring as well, during the PTA Teacher Appreciation Days. I love when products can be used multiple times in a year for multiple reasons. I started by cutting a card base and adding an extra stitched detail from the previously released Lil' Inker Designs Stitched Mats: Rectangles. I then ran two strips of washi tape on the bottom. 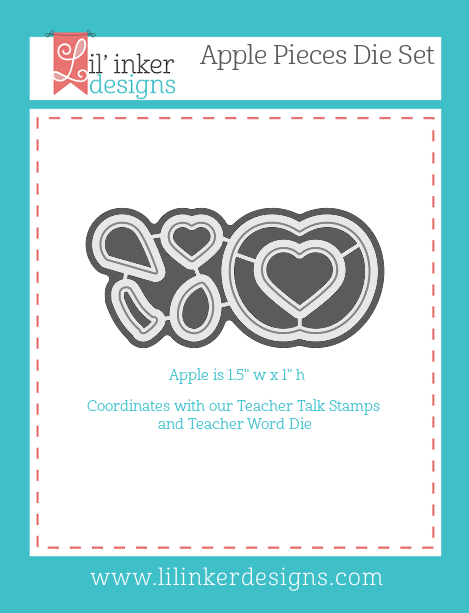 I stamped a golden apple and leaf from Teacher Talk Stamp Set (there are a few designs for the apple! 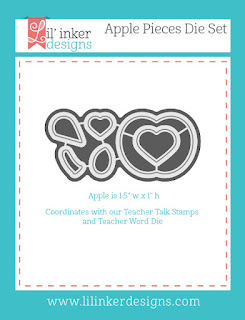 ), die cut them with the coordinating Apple Pieces Die Set an added stamped details-the stem and seeds. I finished the card by adhering a die cut from the Teacher Die and a sentiment from Teacher Talk Stamp Set. Both my boys have male teachers this year, so I really appreciate the modern, clean look of these products. Your next stop is Amy Kolling! This is big. Big news, big giveaway! The Ribbon Resource (The May Arts Ribbon Retail Store) now offers five yard bundles for some of your favorite ribbon! Such a huge, affordable, absolutely perfect option for card-makers!! 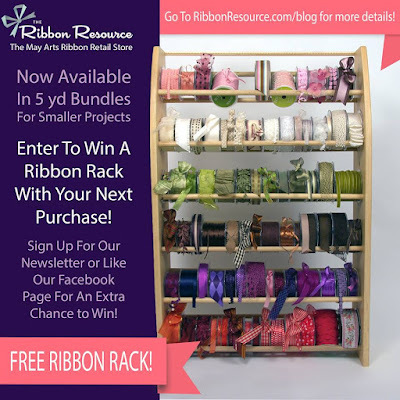 Please stop by The Ribbon Resource Blog for more details and a chance to win a FREE RIBBON RACK! Eek! I want one of these, er, I need one of these! Also sign up for The Ribbon Resource Newsletter and/or like The Ribbon Resource Facebook Page for an extra chance to win!